Costumes have maintained an important place in Chinese culture for more than three thousand years. Moreover, Chinese costumes are magnificent and colorful. Many dynasties throughout China's history each had its own unique style of costumes, with styles changing or disappearing as the dynasty changed, declined, or was replaced. Mài kè: Nǐ jīn tiān zhè jiàn wài tào hěn piào liang, hěn shì hé nǐ. The overcoat you are wearing today looks very nice. It suits you very much. Lì li: Xiè xie. Wǒ Zhè shēn dǎ ban kàn shàng qù hěn xiū xián, shì ma? Lili: Thanks. The way I dress today looks very casual, eh? Mài kè: Shì de. Wǒ hěn xǐ huān xiū xián zhuāng. Mike: Indeed. I like casual clothing very much. Lì li: Wǒ jué de nǐ chuān xī zhuāng kàn shàng qù yě hěn shuài. Lili: I think you look very smart too when you wear a suit and tie (Western clothing). Mài kè: Wǒ yī bān bù zěn me chuān xī zhuāng, chú le cān jiā zhòng yào huó dòng. Mike: I seldom wear formal dress (Western clothes), only when I participate in important activities. Lì li: Wǒ yǒu hěn duō wǎn lǐ fú, dàn chuān de jī huì yě bú shì hěn duō. Lili: I have many formal evening gowns, but I have few chances to wear them too. Mài kè: Nǐ yǒu qí páo ma? Wǒ jué de qí páo hěn yǒu zhōng guó tè sè. Mike: Do you have a cheongsam? I think the cheongsam is very characteristically Chinese. Lì li: Yǒu a. Xiàn zài zhōng guó chuán tǒng fú zhuāng fēi cháng zǒu qiào. Lili: Yes, I have. Traditional Chinese clothes are very popular nowadays. Mai kè: Shuō de duì. Wǒ zhèng dǎ suàn gěi zì jǐ mǎi yí jiàn táng zhuāng ne. Mike: You are right. I am going to buy a Chinese costume for myself. Lì li: Hǎo a. Nǐ kě yǐ shùn biàn zài mǎi yí jiàn mǎ guà. Lili: Good. You could buy a mandarin jacket by the way. Mài kè: Tài yǒu yì si le. Nǐ néng péi wǒ yì qǐ qù mǎi ma? Mike: That's interesting. Could you go with me to buy it? Lì li: Méi wèn tí. Zhè gè zhōu mò wǒ men yì qǐ qù guàng xiù shuǐ jiē ba. Lili: No problem. Let's go shopping along Xiushui Street this weekend. 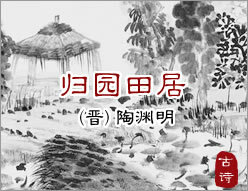 Cǎo shèng dòu miáo xī. Dài yuè hé chú guī. Xī lù zhān wǒ yī. Dàn shǐ yuàn wú wéi.